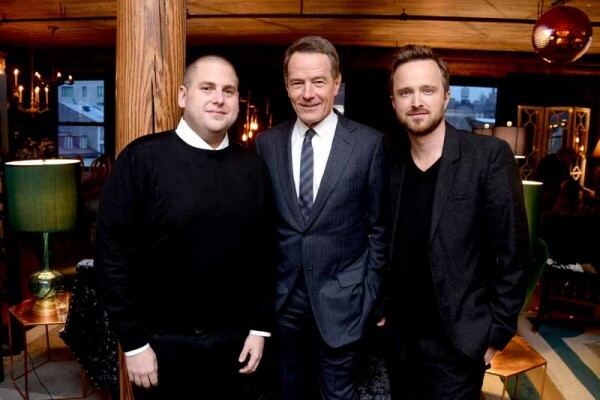 On Sunday, 13 December 2015, Bryan Cranston, Aaron Paul, Helen Mirren, Michelle Monaghan, Harvey Weinstein and friends were at Elyx House in New York City to celebrate all their past collaborations in television, film, theater and the film Trumbo. Trumbo, wherein Bryan Cranston plays the titular role, is a 2015 American biographical drama film based on the life of Dalton Trumbo who was a Hollywood screenwriter who, in 1947, was blacklisted along with other artists for refusing to testify to the United States Congress regarding alleged Communist propaganda in Hollywood films. He spent eleven months in federal prison in 1950. Directed by Jay Roach and written by John McNamara, the film stars Bryan Cranston, Diane Lane, Helen Mirren, Louis C.K., Elle Fanning, John Goodman and Michael Stuhlbarg. The film is based on the biography Dalton Trumbo by Bruce Alexander Cook. The film was shown in the Special Presentations section of the 2015 Toronto International Film Festival and was released on November 6, 2015, by Bleecker Street. Celebrating the film, guests sipped on bespoke Elyx cocktails and CEO of Absolut Elyx, Jonas Tahlin helped co-host the event with Aaron Paul, Jonah Hill, Harvey Weinstein, James Dolan, Mark Johnson, Diane Paulus, Jeffrey Richards and Josh Sapan. Other attendees included: Helen Mirren, Taylor Hackford, Michelle Monaghan, Gina Gershon, John Leguizamo, Margo Martindale, Celia Weston, Tina Louise, Sean Young, Krystal Brown, Jamie Cepero, Casey LaBow, Paul Lacono, Eric “Elew” Lewis, Daniel Benedict and David Zinczenko.